There are quite a few football supporters in my family. As you will know if you have read other of my blog posts, I even joined them for a while. And if you are a true follower of these pages, you will also know that a few years ago I had the crazy idea of making all my Christmas presents. 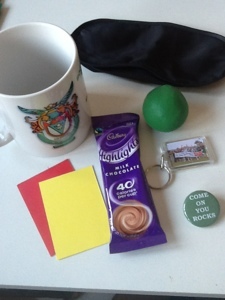 One of the presents I made, for those insane people who like to spend afternoons and evenings out in the cold, was a “Football Supporter’s Survival Kit” containing a selection of items to make the whole experience more bearable. 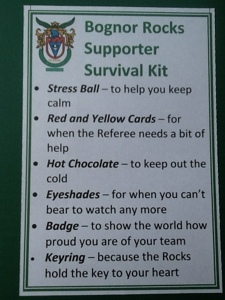 Recently I have been making some customised bits and pieces to sell in the shop at my local football club, and with Christmas coming up a re-visiting of the Survival Kit seemed like a good idea. Anyway, I’m sure you can come up with your own ideas – and the cheesy lines to go with them, of course. 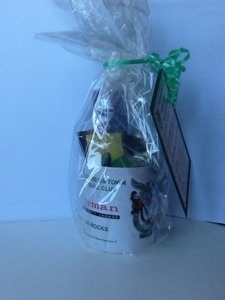 The football club handily had some branded mugs to package it all in, and if your footie fan supports a major team you can probably find a mug for them too. But if not, no matter. The original sets I made were packed in a random box that I covered with plain paper. I printed out the logo of the favoured team – with the good old black and white printer – and I coloured it in by hand. It’s simple, relatively cheap, mostly useful, and can be personalised – as far as I am concerned, that makes it the perfect present. And I’m hoping the football fans down at the local Club shop agree. What a brilliant idea, Mr D is a huge football fan, although a rather obscure Scottish one, I plan to make this for his birthday, (in July so I have enough time to fit it in).